How to Save Calories While Navigating the Sushi Bar. I am a sushi fiend. I can never get enough of the stuff. And if there is a sushi restaurant anywhere near your place, you and your friends have definitely hit that ‘ish up for a night of sake bombing (far from Japanese, but very fun nonetheless), and succulent, satisfying seafood. Hand rolls, maki, nigiri, sashimi, the crazy special rolls…so many options and styles! We know that fish is high in healthy omega-3 fatty acids, but generally, most people don’t stick to just the sashimi portion of the menu. 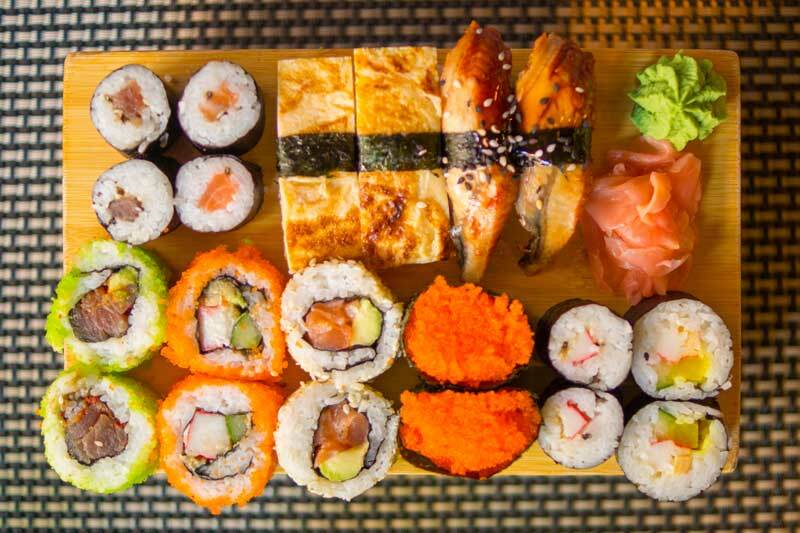 What should we be ordering at sushi if we want to make our sushi dinner a health(ier) one? There are many, many fish in the sea. And for the most part, fish in its plain form is a pretty safe bet to make in the name of health (with a few exceptions for pregnant women and those with compromised immune systems). So that I don’t beat a dead horse for the next 10 minutes, omega-3 fatty acids are important in your diet because they have been shown to decrease inflammation and contribute to keeping your cardiovascular system healthy. Supplementing with fish oils has been shown to reduce the risk of heart disease, stroke, and hypertension. Studies have also found that omega-3 supplements show promise in helping with arthritis, diabetes, depression, cancer, and anxiety. Basically, there is a significant amount of research going on looking at the benefits of fish oils, and most have found that getting your omega-3 dose every day is VERY beneficial. The first concern with salmon is whether it is wild or farmed. 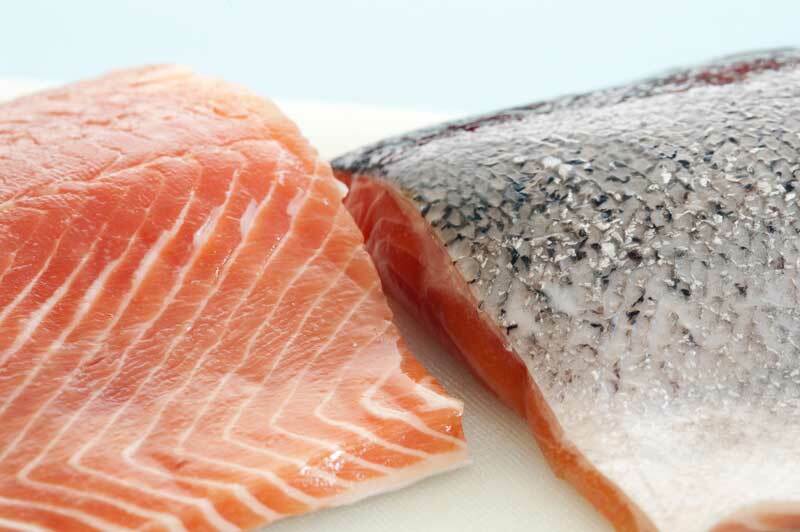 There has been a lot of discussion over whether farmed fish, particularly salmon, is less healthy if farmed. Farmed salmon are often fed corn or soybeans, which is not a food source they feed on in the wild (the same debate is being held over cows and their diets of corn or grass). There have been some concerns over high levels of toxins (due to water treatments of fish farms) that have been linked to stunted brain development, ADHD, and birthing complications. I could talk about the concerns about farmed fish for hours, but I will save that for another article. Salmon contributes about 55% of your DRI of omega-3 fatty acids, which is quite a lot when we compare it to other fish sources. It is also low calorie, with only 51 calories per ounce. Salmon is also a great source for vitamin B12 and vitamin D (which is rarely high in food sources). One of my personal favorites for its light flavor and texture, yellowtail is low calorie with only 41 calories per ounce and contains 0.4 grams of omega-3. Like most fish, it is an excellent source of protein (6g per ounce). Yellowtail is also a good source of selenium, which has been shown to have anti-cancer and antiviral properties. Mackerel is high on the list of healthy for its high vitamin and mineral content. One ounce of mackerel contains 57 calories and is high in vitamin D (rare in foods), vitamin B12, and selenium. In addition, Mackerel is high in potassium, which can help maintain healthy blood pressure. While Mackerel is a good source of omega-3, it does rank higher on the mercury content, so consider consuming this fish less frequently. Part of the Tuna family, albacore is higher in omega-3 than other tuna varieties and has even more than salmon. An ounce of this yummy fish will only cost you 38 calories and has nearly 8g of protein! Again, like mackerel, albacore is a good source of selenium. Keep an eye on mercury content. Unfortunately, virtually all fish and shellfish contain mercury, which acts as a nerve poison and can be detrimental to your health if consumed too frequently. Fish contain mercury because the foods that they regularly consume have been exposed to environmental pollution. Adults typically can handle small amounts of mercury with no problem, but fetuses and children are at a higher risk for mercury poisoning. The safest bet when it comes to healthy sushi is sashimi. Nigiri is basically sashimi with a little bit of rice invited to the party. This isn’t just any regular type of rice however. 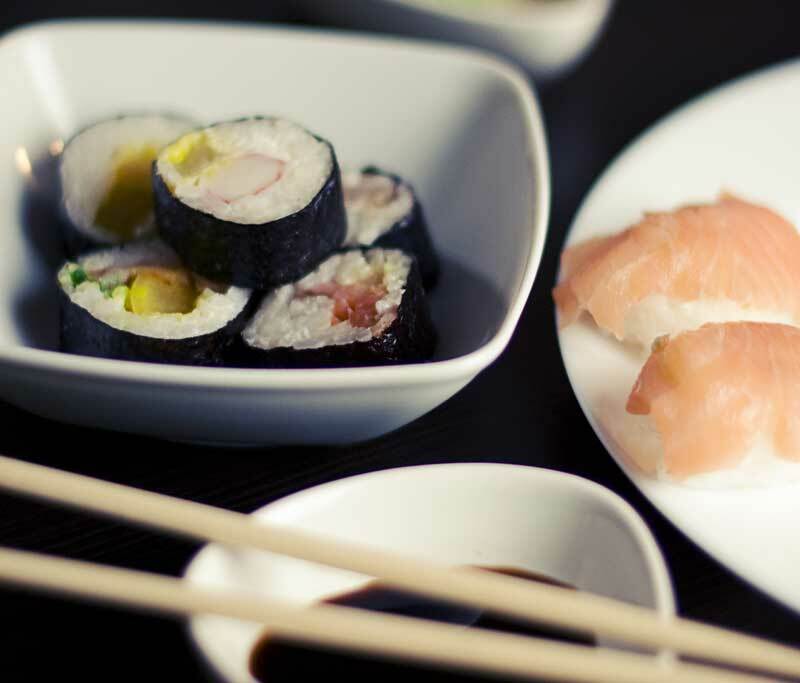 Sushi rice has usually been mixed with rice vinegar and sugar. Generally, 2 tablespoons of sugar are added per 2 cups of rice. With rice already high on the glycemic index, the added sugar is a nutritional bummer, ruining your healthy fish with a carbohydrate bomb just hiding underneath. Very basic with one or two fish ingredients, rice, and nori. Specialty rolls that can be fried, baked, smothered in sauce, etc. Specialty rolls’ calorie counts can get quite high. The culprits? Keep your roll away from the fryer. Avoid rolls that contain the word “tempura” anywhere near them (ie shrimp tempura rolls, crunch rolls or spider rolls). Ask for brown rice instead of white. And if you’re feeling like a boss, ask them to go easy on the rice. Avoid the extra sauce and cream cheese (stick to hot sauce, jalapenos, or low-sodium soy sauce for the extra flavor). Go for the real crab if it is an option. Add a veggie roll to your sushi game. Not only are veggie rolls typically cheaper, but they are healthier. Most sea vegetables are full of nutrients like vitamin K, magnesium, and folate. Typically speaking, the fancier the roll, the more likely it is to be jam-packed with fried, saucy, unhealthy things. My advice? Keep it simple. When ordering #HealthySushi, it’s best to keep it simple. Less is more in terms of nutrition. Soy sauce is a must when you are at sushi. But which one to reach for? 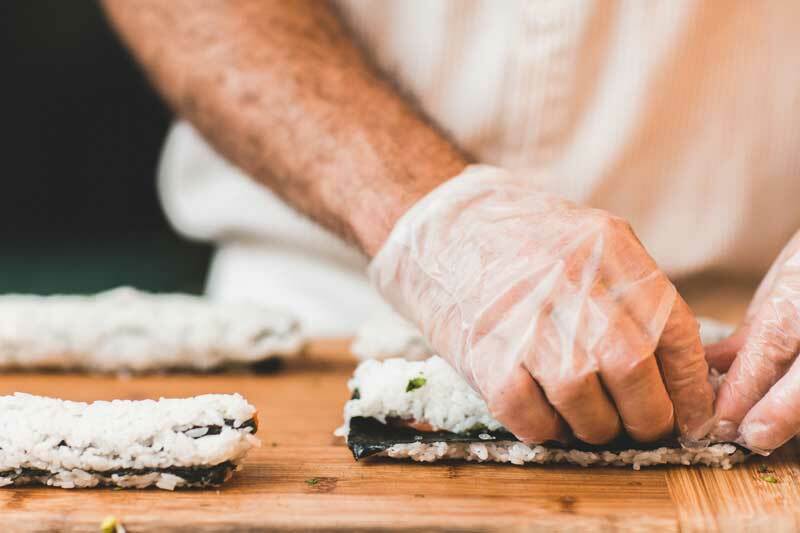 In your sushi journey, you will most likely consume a lot more than a tablespoon of soy sauce, so the switch to low-sodium would be very wise. Wasabi has been around since the 10th century and is considered a Japanese treasure. However, most of the wasabi you are consuming in your neighborhood sushi bar is made of horseradish. Prevents food poisoning and colds from its insecticide and bacteriocide content (the heat can also clear out some clogged sinuses. Wasabi contains a strong antioxidant called sulfinyl which has been linked to reversing early aging. Wasabi has been shown to help block platelet aggregation, preventing heart attack and stroke. No need to get shy with the wasabi, even if it is horseradish-based, it’s a low calories option for a ton of spice and flavor. With only about 5 calories per ounce and 240 mg of sodium, pickled ginger isn’t costing you much for the added bonus of cutting the flavor of rich fish and cleansing your palate between rolls. EAT UP! Add flavor to your #HealthySushi with low-cal options like wasabi and pickled ginger. What is a sushi outing without some sake bombing? The average sake is usually about 16% alcohol and comes in either a filtered or unfiltered form. Each one of those sake shots will set you back 39 calories, a lot less than a shot of liquor (about 100 calories). Daily sake drinkers have been found to have a lower cancer risk than non-sake drinkers. This finding has been linked to the amino acid content of sake. Sake contains 9 different peptides shown to inhibit some of the enzymes shown to cause high blood pressure when in high concentrations. Unlike other alcohols, sake has a moisturizing effect that is most likely due to its protein and vitamin/mineral content. Ferulic acid content found in sake has been shown to absorb UV light, preventing the premature aging of skin. However, if we are going to talk about sake bombs, we should talk about your Japanese beer options. If you are sake bombing, the flavor of the beer is less important, go for something light. 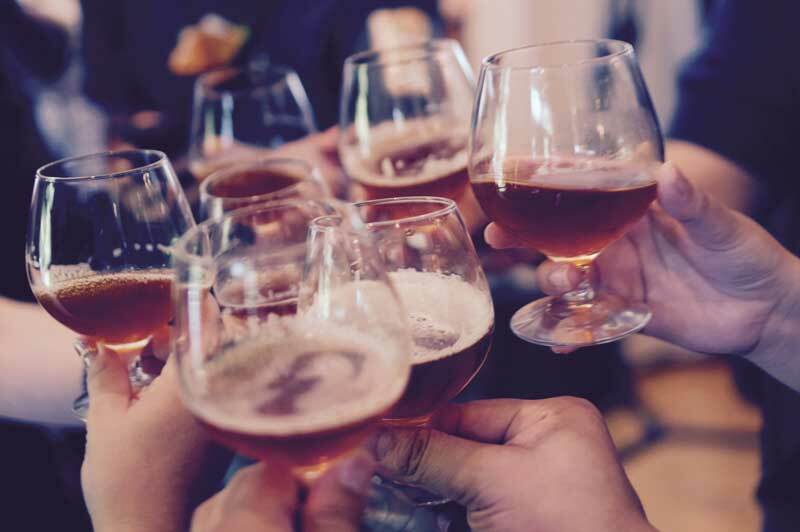 If you are just enjoying a beer, Japanese beer is pretty light in calories across the board, so go for your flavor profile of choice. Congrats! You are ready to navigate the sushi bar now. So, the answer to the question of whether sushi is healthy or not is… sometimes. Overall, sushi in itself is healthy, but choosing the healthiest sushi takes a little practice. Overall, the fish by itself is healthy, but crafting the healthiest sushi lunch or dinner takes a little practice. 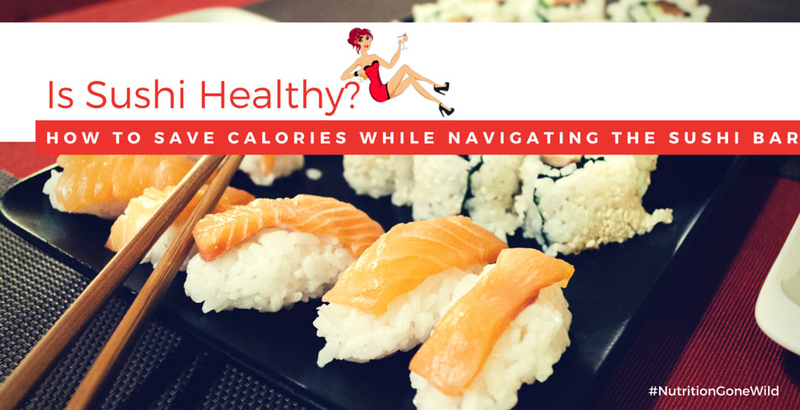 But, now that you know how to navigate the sushi menu to avoid the calorie pitfalls, you can enjoy delicious fish and sake bombs smarter. It is totally possible to make sushi night a healthy night of eating. Just keep an eye on the type of rice you choose, the toppings and fillings inside your rolls, and the type of fish. Have a favorite healthy option at your local sushi spot? Made the extra effort to make sushi at home (props to you)? Tweet me a pic or tag me on instagram! And don’t forget, if you loved this article, share it with your friends. They deserve to know how to choose health(ier) sushi too!